FIELD DAY GEAR: The ordering deadline has been extended for this year’s field day gear due to the snowy weather last week. Orders are now due Wednesday March 28th. Order online or with the paper form. SAVE THE DATE: SATURDAY, MAY 12, 2018 – Overlook will be co-hosting a 5K RACE, immediately followed by a SPRING FAIR at Copper Beech Elementary School. Race starts at 9:30 AM and the Fair from 10 AM – 1 PM. We are in need for sponsors for the race & donations for the fair. If anyone knows a local business owner or has a good relationship with a business in the area, please ask around to solicit interest. All race sponsors will be listed on the back of the race t-shirt and all fair donors will be listed on a bulletin board prominently displayed at the fair. In addition, tables will be available for the fair at a fee of $30 for the 3 hrs for any business wishing to advertise or sell at the fair. PUBLISHING CENTER: Continues this week. We are in need of adult volunteers (with clearances) that can come in and help students edit previously written stories to prepare them to be turned into the books the kids come home with in the Spring. The times needed are Monday: Struthers 9:50-10:35, Tuesday: Brown/Melchor 9-9:45, Amato 2-2:45, Wednesday: Doctor 1:10-1:55. Questions: contact Jamie at jamie@overlookvolunteers.com. 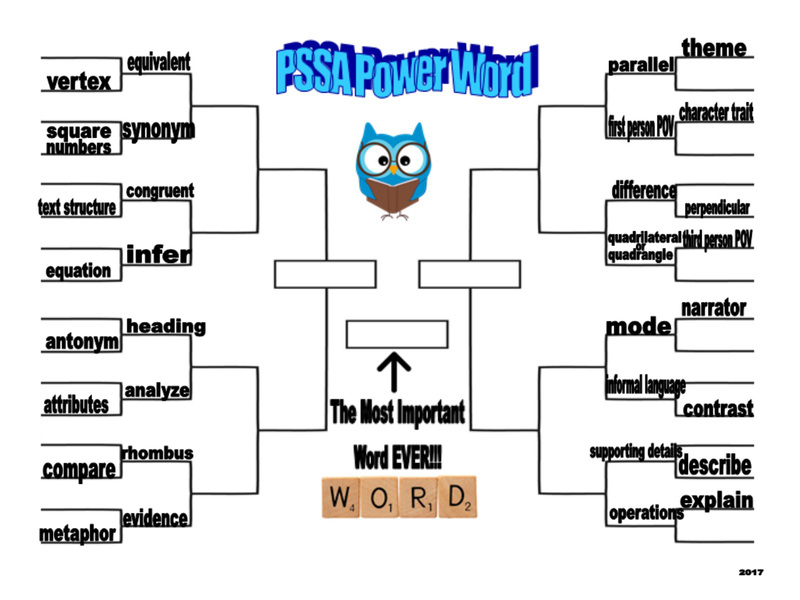 PSSA POWER WORDS: Results of the Sweet 16! Winners of the U-Swirl Giftcards to be announced on Tuesday, March 27. MARCH MADNESS HOAGIE SALE: Lee’s Hoagie House in Abington will be generously donating 15% of all proceeds from orders that mention Overlook Elementary from Thursday 3/15 – Monday 4/2, so be sure to mention Overlook when ordering so that we get the credit. Online orders do not go towards the donation, so make sure you either order in person or via telephone.Here is the Sweet Sixteen for this year’s PSSA Power Words! Posted on March 26, 2018 by OverlookElem	• This entry was posted in Uncategorized. Bookmark the permalink.